Over the past five years Expressions Whirinaki has grown in leaps and bounds, punching well above our weight with world class exhibitions and amazing shows and events. We need to extend the centre in order to accommodate this significant growth and we are embarking on a 7 million dollar extension. 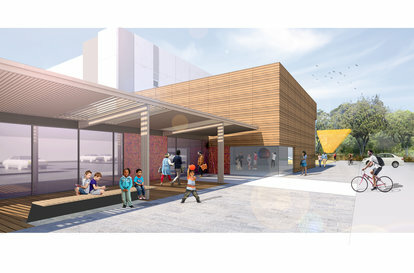 The extension includes a heritage gallery focussing on telling the stories of Upper Hutt. The nationally significant Pumpkin Cottage Collection will be housed in a new climate controlled environment which will be built to museum standards. We are adding a creative workshop which can be used for our school groups, and any other groups looking for a workshop space. And we are adding a kitchen to the Professionals Recreation Hall so that it becomes more functional for all events. The Expressions Arts & Entertainment Trust have already raised over 3 million, including support from The Upper Hutt City Council. The Red Tile campaign, plans to raise $100,000 towards the extension of Expressions Whirinaki. In principle, this target will be achieved when our Friends and supporters make a one-off donation towards the project of either $100, $500, $1000 or $5000. It is intended that the names of the Red Tile Supporters will be commemorated in the extension. Your donation to the Expressions Arts & Entertainment Trust qualifies for a refundable tax credit deductible as determined by current legislation. A receipt will be sent to you at the end of the tax year or on request. Click here to become a Red Tile Supporter.